We spent last weekend at another event that was new to us, though it was the 10th anniversary of the event overall. The fun of moving south means that our day-travel radius has shifted… if we’re willing to push it, as far south as Atlanta. So that’s where we went! The other fun part of this is that we are meeting all new vendors and customers. So we had a nice weekend meeting fun new people. Unfortunatly, much like our show earlier in February, we had a lot of time to meet our fellow vendors. Traffic was light, and those who had done this convention repeatedly all agreed that things were down year over year. Still, we did generally well, met awesome new people, and have some new custom orders to tackle – which I will definitely be sharing in progress pictures of! Keep an eye on our Instagram if no where else. Now on to the photos! I love this dealer’s room sign! I wish more conventions would be creative with it. The nice and not to big dealer’s room. Obligatory picture of Nathaniel finishing pieces in the booth. He’s gained an audience. Another booth photo! The creepy shield did startle a couple of people. Wood spoons and wood knives. We’ve got it covered! A fun example of taking creative inspiration from found objects. The skull sword got lots of attention. There were so many excellent costumes about! Love these two. Steampunk Scarecrow! Wish I’d seen him back when I did steampunk Batman villians for Dragon Con. This woman is determined to spread more positivity to the world, and I love her cause! Awesome time machine made out of a mobility scooter. When traveling in time, you totally need a plasma caster, right? Our big steampunk contraption is finally ready for sharing. Glad they had fun posing with our weapon! Excellent music for the Saturday evening concert. Tuatha Dea were lots of fun! Wish this band had a larger audience, because they were a blast! …or, apparantly, a Harley hammer, since that went home with her for her own customization. Yeah, I am way behind. Glimmerdark was in February, a fantasy and dark fairy convention that took over from Wicked Faire. It had it’s issues as a new/revised event, but I look forward to seeing what it becomes. So to catch up more easily, I’m just going to sum it up in pictures. Enjoy! All set in the ballroom. We had to be a little creative since our booth opened on three sides. My new lightup cloak! Playing with sheer materials for the fairies. Masks and light up blades. The light ups were a hit – one area where occasional darkness was to our benefit. New sign, and lots of cloaks. Happy barbarian fae with her new club! A view down the aisle, for a bit of the show feel. We don’t get out of our booth much. One of the highlights of our September is always Pagan Pride Days. These are lovely one day events all over the country where various people of pagan leanings come together. This year we made our way to three of the events: Frederick MD, Northern Virginia, and Belmont NC. This was our second year at Frederick Pagan Pride, and I am happy to say much less rainy than last year! Actually, it was a beautiful day. The event took place on the front lawn of the Unitarian Universalist Church of Frederick. It was a wonderful setting, welcoming and friendly. And speaking of, we happily got to meet up with various vendor and fair friends as well. Our booth on the hill! Nice collection of ritual tools and cloaks. A bit of the view from inside the tent. Happy customer with our horn-tipped spear, black fleece cloak, and short crystal wand. The beautiful front lawn and its gorgeous willow tree. It feels like you’re in the middle of nowhere here, and it is so peaceful. I’ve had a thing for willow trees since elementary school. Here’s the view from under the tree back towards the church. And a bit of the sunset as we’re all packing up. Kids unfortunately tore down a number of the willow branches, but we got permission to collect what was on the ground to make something out of. So here’s Nathaniel goofing off while collecting them for next year! The following Saturday was Northern Virginia and Belmont NC Pagan Pride Days. I went to NoVa, Nathaniel to NC. So I only have photos from NoVA. It was a little weird being back on my college campus – that had been a while! The setting gave this festival a definitely different feel. And I started off the day with our canopy, which had already been stressed by the winds at Steampunk World’s Fair, breaking as I went to set it up. Thank goodness for PVC pipes and duct tape! This show set up with small blocks, so every space was a corner. So a fun different display. Nope, that ceiling isn’t sagging, really! Thank you show staff and Mark for salvaging that! A better view of my leather leaf clips. Though I think I need a new wig. This was the first nice wig I ever bought and it’s showing the wear. Another inside the booth view, and a view beyond to some of our favorite booth neighbors! We don’t do a lot of one day shows, and this one was unique. Fun, creative… It was great for a small show’s first year, and I really look forward to seeing what it becomes. In August in the historic downtown of Frederick, MD, there is a Penny Farthing race. You know those Victorian bicycles with the huge wheel? Yup, people race those. Steampunk Frederick was located at a small theater about a block away, with all sorts of interesting creative types. It took a lot of adjusting to figure out how we were all setting up in the odd spaces of the hallways and small rooms, but once we worked that out it was a fun, long day. We got our almost two tables worth of space along a wall across from the entrance to the actual stage. Thank you neighbor, we think you’re awesome too! Hello again Momo! It’s fun seeing rennaissance faire vendor friends at the steampunk shows. And our steampunk vendor friends, bringing out their awesome costumes! Steampunk Dalek and a penny farthing. I love the pairing. Great costumes are definitely the highlight of a steampunk event. Moment of recognition for contributions to the steampunk community. Hello again! We are entering our slow time between shows, so I’m getting caught up on all of my show photos and such from this past year. Then it’ll be time for year in review and fun planning for next year! Scares That Care Weekend is one of our favorite events. It is not our most profitable, but it’s a weekend of awesome people who love horror and trying to do good for charity. This year, we got a whole conference room to fill with our stuff however we wanted. Up side – we could show off a lot of stuff and be creative with our display. Downside – the second floor gets less traffic and the room we chose was… well, more hidden than we realized. … and into room 14! We posted lots of these posters to try and help people find us. Plus, first show with our new logo! Nice and open room to show lots of different products! Room was an unusual shape, but that meant we could set up a nice sales and work table. More shadow box kits! People got a good laugh out of these. 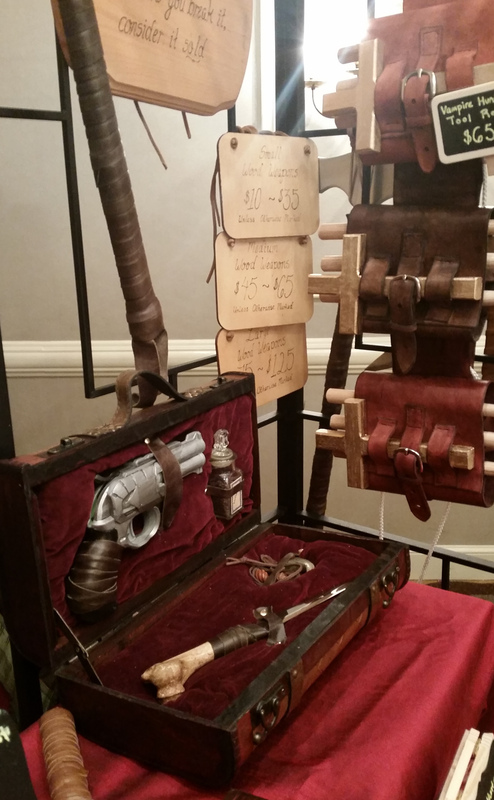 Swords, props, bottles… so much to shop through! Costumes around the event were awesome. The Chanels and the Red Devil came for a visit. Even out in the parking lot people were having a silly, fun, horror time. Huge thanks to all of our helpers who showed people where we were! We are already paid up for next year. We will be on the second floor again, but in a more obvious room next time. And we’ll go even further on atmosphere and display! I can not say enough positive things about the staff of Steampunk World’s Fair. It was everything else that went wrong. So, first there was pouring rain during set up. Made the traffic to get there horrible, and we showed up just before the show was supposed to open. 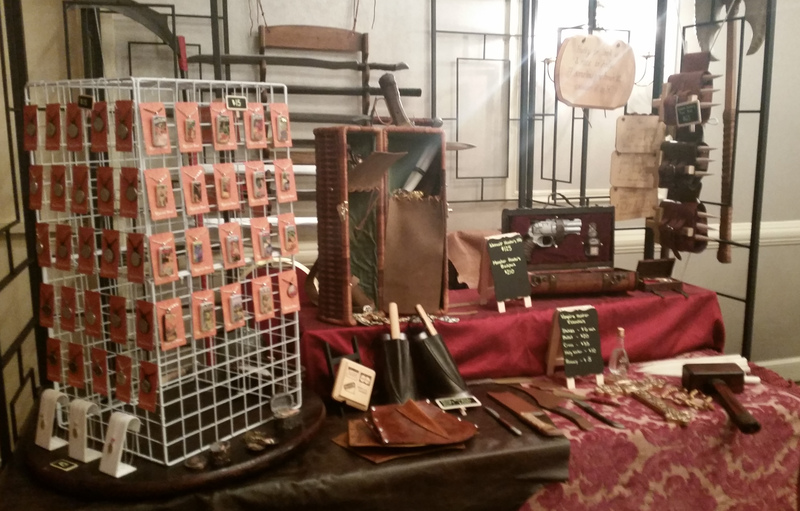 Steampunk World’s Fair has a vendor set up different from any other show we have done. There were several different places that vendor tables and booths could be set up – ballrooms in each of the two hotels, first floor rooms in the hotels, hallways in the hotels, and the outdoor midway between the two hotels. We were located in the midway. Which, if the weather had been nice, would have been a really neat place. There were a lot of vendors and the main stage, giving the whole area a really festive feel. Browsing the damp booth on Friday afternoon. I didn’t have time to catch many costume photos, but I loved this Spidey. Happy customer! The giant hammer finds a new home. We were allowed to pull up even though we were late, rush set up in the rain, and were ready to go. The weather cleared, and Friday night was awesome. It also is one of the few shows we do that goes to after dark. That means good booth lighting if you are outdoors is a must. Friday night at the World’s Fair. The booth lighting and the concerts made this so festive. Saturday started good, but then the clouds and wind really picked up. Rain is manageable, but wind is complete havoc on an outside show. About 4:30 the clouds got really, really dark and we found out about a lightning storm coming in. So with all of us with metal tents, we were told to evacuate the midway. This was another time the staff was awesome, as well as the guests. We had so many helping hands to first get our inventory packed up and inside, and then getting the tent taken down and into the van. We waited out the storm from the van, then came back about 7 to set back up. A bunch of other vendors did not return that night… which, since it was also a big concert night, made it the best part of our sales. 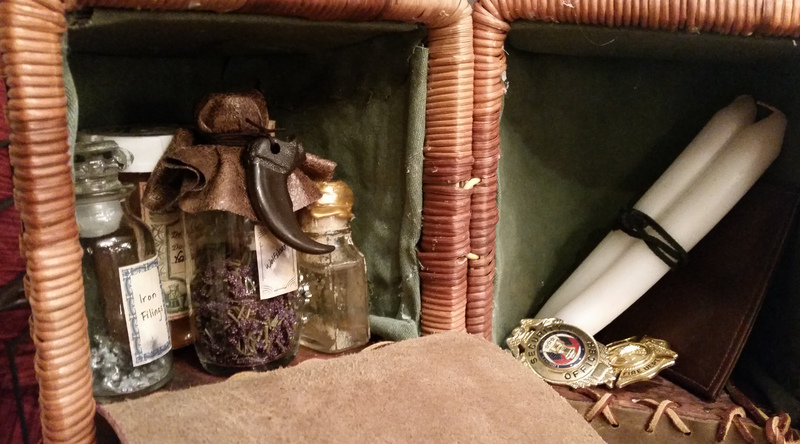 Adventurer’s tea sets – one of my big hits of the fair. Fun Steampunk jewelry, made with pieces of old books, gears, propellers, wings, and crystals. Plastic refinished toy guns – a lot of these still made the ridiculous sound effects. For pirates, airship or otherwise, a hand tooled leather water skin. Unfortunately, setting back up also resulted in a call from the staff at 2:30 in the morning. The wind had picked back up and our tent had tried to make a break for it. The staff was awesome – we showed back up to find everything broken down and anything that might blow away weighted down. We packed up and got what sleep we could. Which leads us to Sunday. First, the adventure of getting to the show. The convention was right near Rutger’s University, and that day was their commencement. On top of that, the speaker was President Obama, which meant all sorts of road blocks. We got lucky – a cop managing one of the blocks recognized us as heading to Steampunk World’s Fair, and gave us directions that would get us there. Other visitors were not so lucky. We made it back out the try and set up again to find even fewer vendors outside. The wind was vicious. We and one of our neighbors gave up on attempting tents after they tried to blow away the moment we tried to set them up, and went for just tables and product, yard sale style. About an hour of that, and the vendor coordinator offered those of us who wanted to move tables in one of the hallways. So, we condensed our 10 ft by 10 ft booth inventory to a single table as best we could, but at least we still had the chance to sell all three days. Light up knives and whatever we could fit on the hallway table. What’s left on Sunday – we needed more inventory! We learned quite a bit with this show. We really hope to do this show again, but any indoor space we can get. And we know better what inventory to bring. For one, we need more of it. My adventurer tea sets, which I launched at this show, almost completely sold out. Nathaniel almost completely sold out of his refinished toy guns and light up knives. And above all else, we have to say, this staff was awesome. Wyrd Armouries – all your monster hunter needs! Wyrd Armouries just got back from our first horror convention, and it will not be our last. Scares That Care Weekend is a small convention as the ones we attend go, but one with an excellent atmosphere, a great staff, and fun people. Plus, they are very serious about the money they make going to charity, which is very important. We had some minor hiccups as vendors. When we started, our table was kind of tucked back in a corner, and thus people didn’t really approach. It was made worse when one table next to us didn’t show, so people would swing wide and barely look. But the staff was nice and fine with us moving a bit on Saturday, which helped not just us but the other occupied table next to us. There was also the fact that is was our first time at this convention, and our first time at a horror convention at all. As a result, we tried out several new products, in as a mix with the ones we usually bring. It was very easy by the end to see what sold and what people had no interest in, so we know better what to bring next year. And yes, this convention is on our “will do again” list. We already have ideas! But until then, visit us next weekend at Richmond Comic Con! Our booth at Scares That Cares. Tweaking our display and colors all the time – I rather like this look. 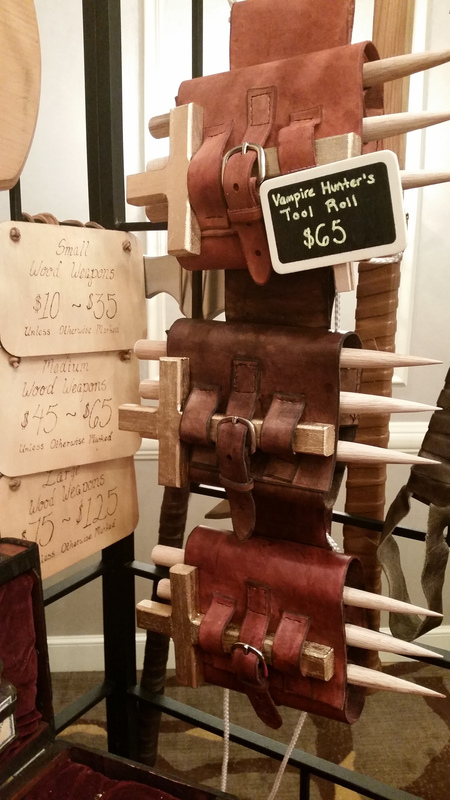 Vampire Hunter’s Tool Rolls – one of my new products, and one of our hits of the weekend. Must make more! Inside the monster hunter’s backpack. Quick and easy monster repellent, candles, badges. People had good laughs looking into this set.